- Active. 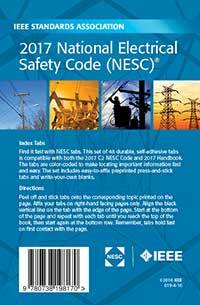 2017 National Electrical Safety Code (NESC(R)): This Code covers basic provisions for safeguarding of persons from hazards arising from the installation, operation, or maintenance of (1) conductors and equipment in electric supply stations, and (2) overhead and underground electric supply and communication lines. It also includes work rules for the construction, maintenance, and operation of electric supply and communication lines and equipment. The standard is applicable to the systems and equipment operated by utilities, or similar systems and equipment, of an industrial establishment or complex under the control of qualified persons. 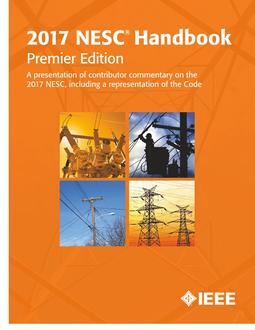 The 2017 NESC Handbook, Premier Edition, is an essential companion to the Code. This handbook includes text directly from Code which provides users an easy reference back to the code, ruling-by-ruling. It gives users insight into what lies behind the NESC's rules and how to apply them. 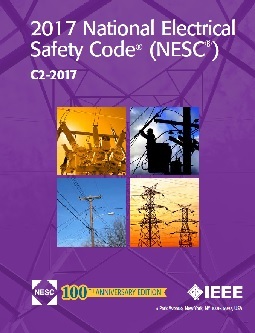 The Handbook was developed for use at many levels in the electric and communication industries, including those involved in system design, construction, maintenance, inspection, standards development and worker training.